After two dismal years, the banking industry in the world’s developed markets is flourishing again. The recovery of the financial markets from March 2009 (and earlier in the case of many emerging markets) came sooner and faster than most had predicted. By the middle of 2009, the events of September and October 2008—when much of the banking system was on the verge of collapse and nationalization re-emerged after decades in the wilderness—seemed like a distant nightmare. As markets recovered, so, in many cases, did banks. The resurgence of the banking sector—and the broader global economy—was driven by unprecedented actions by governments and central banks. In the United Kingdom and elsewhere banks have been taken into public ownership; in the United States the $700 billion Troubled Asset Relief Program, which initially targeted the nine largest financial institutions in the country, effectively bailed out almost the entire financial system. At the same time, central banks took interest rates to historic lows and massively increased liquidity programs—ostensibly in an attempt to get credit to businesses and consumers. Evidence that the strategy succeeded in its stated goal is limited: Even now, getting a small business loan is much harder than it was two years ago. However, what the injections of liquidity by central banks did achieve was a restoration of confidence among investors, corporates and the general public. While it is clear that economic pain in the developed world will persist for years to come, financial Armageddon has been averted. As a consequence, equity and bond markets enjoyed, until January 2010, one of the strongest rallies in history. What has this meant for the banking sector? Clearly for those banks with exposure to markets it has been possible to dramatically increase earnings. Corporate bond issuance in 2009, for example, was the highest on record (ironically due to the lack of bank debt available), resulting in a boon from underwriting fees for banks involved in that sector. For other banks, the picture is more mixed. While many bad assets have been taken out of the financial system—either through explicit government-backed schemes or through write-downs—banks still remain exposed to high levels of distressed assets. Consultancy firm Deloitte estimates, for example, that more than 20% of the $6.4 trillion US commercial real estate loan market will come due before 2012. With both real estate and the loan market still some way off a full recovery, it remains to be seen what impact the necessary refinancing of this debt will have on the banking sector. It is worth remembering that the financial and economic crisis began in the US real estate market, and it is not inconceivable that its problems could derail the stabilization of the global financial system. At the same time, the broader challenges facing banks are intensifying. Having spent much of the past 18 months recapitalizing through multi-billion dollar rights issues—Italy’s UniCredit was among the most recent, raising €4 billion in February—banks are now faced with ever tighter restrictions. With bankers’ bonuses and levels of bank lending now considered mainstream political issues—and a tsunami of new regulations due to be introduced later in 2010—it has become tougher than ever to be successful in banking. Fitch Ratings’ most recent review of the banking sector noted that rating actions in the fourth quarter of 2009 were positive for the first time since the onset of the financial crisis in the third quarter of 2007: The proportion of positive bank rating actions increased to 54% from 24% in the third quarter of last year. Indeed, the outlook for banks is increasingly promising. “Banks’ trading profits will continue to overpower loan losses,” notes Robert Quinn, European equity strategist at S&P; Equity Research. While the credit loss cycle, as opposed to the write-downs on securities, still has some way to go, he believes that a peak was reached in 2009 and that, therefore, the situation will continue to improve. Global Finance has retained some changes introduced last year for its best developed market bank awards. For example, the country categories of Iceland and Ireland remain absent because no clear leader has emerged in either country following the effective nationalization of both countries’ banking sectors (explicit in the case of Iceland, implicit in Ireland). As ever, the awards are judged according to criteria such as growth in assets, profitability, geographic reach, strategic relationships, new business development, innovation in products, and banks’ ability to conduct and fund themselves; the spate of rights issues to recapitalize banks has, for example, provided a useful indicator of banks’ relative strengths. The selection of winners is based on extensive consultations with bankers, corporates and equity and credit analysts worldwide. 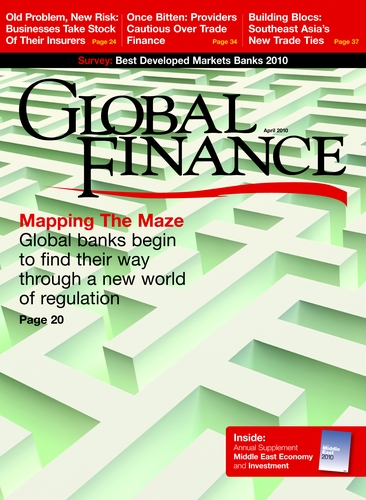 However, it is ultimately the decision of Global Finance ’s editors. Butterfield Group, Bermuda’s first and largest independent bank, had a tough third quarter (the most recent results available). Net income for the group (which also includes operations in the Bahamas, Barbados, the Cayman Islands, Guernsey, Hong Kong, Malta, Switzerland and the United Kingdom) was just $7 million for the quarter compared to a profit of $80.5 million in the third quarter of 2008—albeit the change was exaggerated by the exceptional sale of its fund services business a year earlier. The Canadian banking system has been the star performer of the financial crisis. Its reputation for prudence has stood it in good stead and positioned it well to take advantage of the opportunities created by the problems other banks have suffered. Among Canadian banks none has been more successful at this than Royal Bank of Canada. It reported 2009 cash net income of $5.03 billion for the year ended October 31, 2009, up $357 million or 8% from 2008. “Our results through 2009 underscore the value of our diversified business model, ongoing cost discipline and client-first approach to doing business,” says Gordon Nixon, president and chief executive officer. “Our robust capital base and solid financial profile should enable RBC to continue to extend our broad-based leadership position in Canada and strengthen our global capabilities.” Appropriately, RBC’s Canadian operations were among the group’s best performing, with volume growth of 11% and an efficiency ratio of 47.8%. JPMorgan Chase played the financial crisis better than any other US bank. It retained its credibility, client base and independence; indeed, it was able to buy Washington Mutual and in February announced it would acquire commodity business RBS Sempra. JPMorgan Chase’s figures for 2009 highlight its remarkable strength: It generated net income of $11.7 billion on record revenue of $108.6 billion. Moreover, unlike banks such as Goldman Sachs, it has the broad base of business that is expected to be critical in the coming years as the so-called Volcker rule limits the risk-taking ability of US banks by restricting proprietary trading. In addition to being ranked number one in global investment banking fees in 2009, JPMorgan Chase also opened more than 6 million new checking accounts in 2009. “We benefited from the diversity of our leading franchises,” says chairman and chief executive officer Jamie Dimon. “Throughout these tumultuous times we never stopped investing in the fundamental growth drivers of our consumer businesses.” The bank maintains a solid financial footing—its tier one capital increased during 2009 to 11.1%—while pushing the right political and social buttons: It launched a new initiative during the fourth quarter to expand lending to small businesses by up to $4 billion in 2010. While the balance sheet of Raiffeisen Zentralbank Osterreich (RZB) was 3.6% lower at the end of September 2009 than a year earlier, its 11% growth in operating profit meant that the bank improved its cost/income ratio by 3.2 percentage points to 49.6%. As the only fully locally owned large bank in Austria—and Austria’s biggest banking group, with the country’s densest banking network and a market share of about one-quarter of the country’s aggregate banking market—RZB is always the bank to beat. However, the bank bore its responsibilities well: It increased its loan origination by 2.8% in the year to the end of September 2009 compared to an increase of just 1.1% for Austrian banks overall. Like other banks, RZB spent much of 2009 raising capital, although it already comfortably exceeded all regulatory capital requirements. It issued a total of €2.5 billion in participation capital in 2009, of which €1.75 billion was subscribed by the Republic of Austria while €250 million was placed among shareholders and another €500 million was issued in a public offer—underlining the high level of trust that investors place in RZB’s strategy and business model. Few countries’ banking systems have endured as much upheaval as Belgium’s has in recent years, and while ING Belgium is only the fourth-largest bank in the Belgian market, with a market share of 13%, it appears the best positioned to take advantage of the opportunities this recent turmoil has created. ING Belgium is in the process of becoming the first Belgian universal direct bank, delivering private banking and banking for professionals, mid-size companies, larger corporates and institutional clients. The bank aims to do this by making banking easier and by innovating—including by making 520 of its 786 branches semi-automated by 2012. Given the uncertain economic and financial environment, Bank of Cyprus’ achievement in meeting its targets for 2009 is impressive. The group’s profit after tax for 2009 reached €313 million, while return on equity was maintained at 14%, a satisfactory return given the intensity of the financial crisis. Net interest income and commissions recorded an annual growth of 8%, reaching €1.09 billion for 2009, reaffirming the group’s ability to achieve increased recurring profitability even in adverse economic conditions. At the same time, the bank achieved significant improvement of its capital base (its tier one ratio improved to 10.6% by the end of 2009), maintained ample liquidity (a loans-to-deposits ratio of 90%) and satisfactory loan quality (ratio of non-performing loans at 5.6%). This solidity should set Bank of Cyprus up to achieve its goals for this year—maintaining a strong liquidity position and capital adequacy, improving efficiency and cost containment, satisfactory profitability and effective risk management. In addition, the bank aims to further enhance its presence in the new markets in which it operates—most notably Russia—which have strong growth potential, creating long-term diversification of income, profitability and risks. Danske Bank Group posted a net profit of around €200 million in 2009—slightly better than expected, and acceptable given the difficult macroeconomic conditions. The bank’s total income rose by an impressive 38% over 2008 levels, with much of the gains generated by exceptionally high net trading income, particularly in the first half of the year, higher net income from its insurance business and higher net interest income. Nordea is the Nordic region’s biggest lender but fared well in 2009 despite the broad slowdown in regional growth and the escalating crisis in the neighboring Baltics. For the financial year 2009, income grew 11% while risk-adjusted profit was up 22%. Impressively, Nordea used the weak environment to build its business, increasing its high-end “Gold” and private banking businesses by 158,000 accounts. Similarly, despite the weak economic environment, income from corporate customers increased 8%. Along with Santander of Spain, the French banks—most notably Société Générale and BNP Paribas—have been among the most impressive European performers during the testing times of the past two years. Of the two, BNP Paribas has the edge. It enjoyed a dramatic boost in results in 2009 and used the financial crisis to pick up an attractive asset—and a new home market—with Fortis in Belgium and Luxembourg. While 2009 was a good year for BNP Paribas, its future appears more exciting still. Synergies from the integration of Fortis should yield as much as €900 million in savings; the bank plans to roll out a new integrated model across all of its European operations to increase efficiency and cross-selling, and it expects to grow strongly in markets such as Mediterranean Europe and Asia. As the only major bank in Germany not requiring government support during the financial crisis—and one of the most powerful forces in global banking—Deutsche Bank is the stand-out financial institution in the country. The scale of its recovery in 2009 from a terrible 2008 was startling, even allowing for the swift recovery of financial markets. Net income in 2009 was €5 billion compared to a net loss of €3.9 billion for 2008 while income before tax was €5.2 billion versus a loss of €5.7 billion in 2008. The biggest turnarounds came in the corporate and investment bank unit, where fourth-quarter net revenues were €3.5 billion compared to a loss of €3 billion in the same quarter of 2008, and in corporate banking and securities (CB&S;), where fourth-quarter net revenues were €2.9 billion compared to a loss of €3.7 billion in the same quarter of 2008. “Deutsche Bank delivered very substantial profitability while simultaneously reducing risk and balance sheet leverage,” says Josef Ackermann, chairman. “We used these good results to bolster our capital base, and our capital ratios are stronger than ever.” Deutsche Bank’s tier one capital ratio was 12.6% at the end of 2009, up from 11.7% at the end of the third quarter 2009 and 10.1% at the end of 2008. Ackermann attributes Deutsche Bank’s success to its taking decisive strategic action in 2009. Greece has been at the sharp end of the financial crisis in the past six months, and its banks—EFG Eurobank included—have not escaped. The country’s four largest banks were downgraded by Fitch to BBB in late February as a result of the implosion of the Greek economy; they are now just one grade away from being junk. Nevertheless, despite a troubled backdrop, EFG Eurobank continues to produce impressive results. In the most recent available figures, net income for the third quarter was 26.6% higher than a year earlier while profits before provisions increased by 6.4% to a record high. At the same time, EFG Eurobank is keeping costs under control: Operating expenses declined in the third quarter, with a 6.6% fall year-on-year—the best performance in the Greek market. The bank’s foundations also remain solid. Capital adequacy is strong and increasing, with the total tier one capital ratio hitting 11.5% in the third quarter. Perhaps most impressively, EFG Eurobank was able to raise €2.8 billion in 2009 by tapping the international markets without the guarantee of the Greek state—something many of the largest names in European banking were unable to do last year. Intesa Sanpaolo is the leading player in Italy in retail, corporate and wealth management and ranks among the top lenders in Europe. With a network of more than 6,000 branches—and a market share above 15% in most Italian regions—the group serves 11.1 million customers. Intesa Sanpaolo’s broad strength has provided support during the financial crisis. By prioritizing sustainable profitability driven by strategic decisions concerning not only revenues and costs but also liquidity, solidity and a low risk profile, the bank has been able to generate steady growth in profitability throughout the financial crisis. In the third quarter of 2009, operating margin after loan adjustments was up 6.9% from the previous quarter, which, in turn, had marked a 20.2% increase from the first quarter of the year. Banque et Caisse d’Epargne de l’Etat (BCEE) is the best-rated commercial bank in the Grand Duchy of Luxembourg—partly because its capital is entirely owned by the Luxembourg state. However, the bank owes its leading position in the country to much more than being state-owned. BCEE is the only true universal bank in the country and has a unique relationship with Luxembourg’s citizens: Some 70% (up from 64% last year) of residents have a banking relationship with BCEE, and some 52% (up from 46%) consider BCEE as their principal bank. Deposits of retail and public customers rose by 24% in 2009. In addition, BCEE is the biggest lender to local authorities. BCEE’s centrality to Luxembourg life—and its status as a state-owned bank—does not mean the bank is not focused on the bottom line: At the end of June 2009 (the last figures that are available) the bank had increased net profit by 33.7% on a year earlier while maintaining a tier one ratio of 14.3%. “BCEE is confident in its ability to continue to develop its activities and to act as a responsible player serving the best interests of its clients and of the national economy,” notes its management board. Rabobank’s market leadership in almost all product segments in the Netherlands—in addition to its unrivaled strength as a food and agribusiness bank worldwide—is combined with a conservative policy toward risk that has allowed it to retain its triple-A rating from both Standard & Poor’s and Moody’s. Inevitably, the slowdown in mortgage and corporate lending has affected Rabobank. However, in the first half of 2009 (the most recent figures available) it was still able to achieve a solid net profit of €1.3 billion while improving its capital position with a tier one ratio of almost 13%. Norway’s largest financial services company, DnB NOR is one of the few banks in Europe that consistently delivered profits throughout the recent years of financial turmoil. Moreover, while many of its Nordic rivals—most notably Sweden’s SEB—delivered below-expected results in the fourth quarter of 2009, DnB NOR has surprised on the upside. The bank recorded higher profits in 2009 than a year earlier and was able to resume its dividend policy. Write-downs on loans for the year turned out to be lower than predicted. Moreover, the size of write-downs for the fourth quarter was significantly smaller than in previous quarters, indicating that problems have peaked. DnB NOR’s broad business base—it is growing its market share in retail banking and home loans while retaining its position as one of the world’s leading arrangers of energy and shipping loans—should stand the bank in good stead as it seeks to increase profits further in the coming year. Against a backdrop of strong economic deceleration, Santander Totta’s customer-focused business model generated a 7% growth in customers. As a result of an effective management of spreads and volumes, net interest income increased by 5.9% in 2009 compared to a year earlier while net operating income, excluding financial transactions, grew 5.6%. Santander Totta’s increased focus on small and medium-size enterprises not only supported the Portuguese economy at a crucial moment but delivered results: The bank was the most profitable in Portugal, with a return on investment of 20.8% in 2009, and also had the best cost/income ratio and best non-performing loan ratio. Meanwhile, its financial strength has been reflected in high solvency levels, with tier one capital of 11% in 2009 compared to around 10.1% in 2008—the highest among Portuguese banks—and the highest credit rating in Portugal. Santander’s acumen during the financial crisis is, of course, well established. It is the only bank involved in the acquisition of ABN AMRO not to have ended up in state ownership. Moreover, it bought the right assets from the Dutch bank to meet its business goals and then integrated them effectively. What is more remarkable is that Santander has continued to make astute judgments that have allowed it to continue to grow in Europe, and across the world, at a time when other banks have floundered, leading to a conclusion that the principles that are driving the business must be correct. “The Santander Group’s capital adequacy and liquidity are in better shape than they were at the onset of the crisis,” says Emilio Botín, chairman. “Without having needed any government aid, we are among the most solvent banks in the world.” Moreover, for the second consecutive year, in 2009 Santander was among the top three banks in the world in terms of profitability. Net operating profit for Santander, which focuses on 10 core markets, increased 24% in 2009, while overall profit rose 44%. Handelsbanken, Sweden’s second-largest bank by market capitalization, has weathered the financial crisis well—partly due to its limited exposure to the Baltic countries, unlike its peers. The bank, which has 461 branches in Sweden and 62 in the UK (where it anticipates rapid growth), has not required a government bailout and has remained profitable throughout the turbulence of the past two years. In 2009 operating profit fell although underlying profit before losses continued to grow, and there were several areas of considerable growth: Net interest income rose by 14%, average loan volume increased by 8%, household deposits rose by 16%, and net fee and commission income went up by 9%. Perhaps most impressive—given that Handelsbanken did not require state support of any kind—was that its tier one capital rose from 10.5% to 14.5% in 2009. Although it has performed significantly better than its closest rival, UBS, in almost all areas, Credit Suisse has hardly escaped the financial crisis. However, the bank has adapted well to the new market environment. It introduced a client-focused, capital-efficient strategy early in 2008 and exited most proprietary trading businesses in the fourth quarter of the year. Credit Suisse also established a very strong capital base, meeting Swiss regulator Finma’s requirements for capital and leverage, which are scheduled to take effect in 2013. The bank also demonstrated effective liquidity management; indeed, it was a net provider of liquidity during the crisis. Until 2004 Santander was unknown on the British high street. The bank acquired Abbey in 2004 but retained the well-known British brand, remaining largely invisible. All that changed during the financial crisis, which presented Santander with a once-in-a-lifetime opportunity to build its UK operations rapidly and at an attractive price. It acquired Bradford & Bingley’s savings and branch network in September 2008 and Alliance & Leicester in October. By the end of this year all of these operations will have been rebranded to Santander. The Spanish bank has, in the space of six years, become the third-largest bank in the UK, with 1,000 branches. Such dramatic expansion might be expected to distract Santander from maintaining profitability. However, in the fourth quarter of 2009 the bank’s UK operations reported a fifth successive quarter of growth; pre-tax profits for the last three months of last year grew by more than 30%. Revenue in 2009 grew by over 20% while Santander’s cost-to-income ratio improved by more than 8% in the year, nearing 40%—making the bank the most efficient of its peers in the UK. At the same time, Santander improved its loan-to-deposit funding ratio to 126% (from 135% in December 2008). Commonwealth Bank of Australia (CBA) has been a clear winner in the domestic banking market during the financial crisis. Its strength in the retail market—and its further pursuit of this market through the acquisition of troubled UK bank HBOS’s Australian unit BankWest in October 2008—delivers powerful diversification benefits. These, in turn, have created a robustness of profits for CBA, the largest bank in Australia by market capitalization, that its rivals cannot match. In the league of global universal banks (in which there are only really two contenders, HSBC and Citi), it is clear which has emerged from the financial crisis the stronger. HSBC famously resisted attempts by the UK government to be involved in a broad bailout of the UK banking system and took its time in raising additional capital through a rights issue. Domestically, HSBC remains unassailable. The bank underscored its commitment to Hong Kong—and Greater China—when it announced in September 2009 that its group chief executive, Michael Geoghegan, would move from London to the city, although for tax and legal purposes HSBC will continue to be based in London. Remarkably, Israel’s fourth-biggest bank, Mizrahi Tefahot Bank, has continued to grow its profits during the financial crisis. Its most recent results, for the third quarter of 2009, show net profit was 11.4% higher than a year earlier while return on equity remained a respectable 13.3%. To be sure, net profit for the nine-month period to the end of the third quarter fell—as did that of its peers. However, Mizrahi Tefahot has withstood the crisis effectively and, crucially, has strengthened its capital base. In the third quarter, following the trend of other recent quarters, the bank increased its ratio of total capital to risk elements to 12.48%, even before Basel II rules took effect. According to the bank, the transition to Basel II rules would increase its capital adequacy ratio by about 1.5 percentage points, to approximately 14%, making Mizrahi Tefahot the only one of the top five banks in Israel to significantly increase its capital adequacy as a result of the transition. Sumitomo Mitsui Financial Group had a shockingly bad start to the crisis as bad debt, and its huge equity exposure to its corporate customers, hammered profits. However, the bank—Japan’s third largest by assets—has recovered well and in 2009 was strong enough to be able to buy Citi’s Japanese brokerage business, Nikko Cordial, and further bolster its presence in that market. While all of Japan’s major banks experienced a recovery in 2009, Sumitomo Mitsui Financial Group’s financial results demonstrate that it has been at the forefront of this turnaround. In the nine months to the end of December 2009, the group recorded a staggering 197% increase in net income as Japanese stock markets recovered and bad loans fell (bad-loan-related costs at Sumitomo Mitsui Banking Corporation fell 34.7% in the third quarter compared to the previous year). Southeast Asia’s biggest bank, DBS, is on the threshold of great change as it seeks to expand more aggressively outside Singapore and Hong Kong—graphically demonstrated in January 2010 by the opening of a new China headquarters in Shanghai—and leverage its scale more effectively in some of the rapidly growing markets on its doorstep. Fourth-quarter results, the first under new chief executive officer Piyush Gupta (formerly at Citi), were a good start, with a 67% increase in earnings and a 17% increase in profit before allowances for the full year (to a record level) due to a 36% rise in fee and commission income, which more than offset the steep 43% increase in non-performing loans.